This recipe comes from a blog called “Old Farmhouse Cooking,” which claims this squash dish was served at the first White House dinner. I have no information about that, but it sounded like a good combination of apples and squash for a Thanksgiving table, so I gave it a whirl. It turns out that this veggie dish is not only very tasty, but also works well as a vegetarian main dish. I’ve been eating the leftovers for lunch these last two days, and I will continue to make it throughout the winter because it’s that delicious. 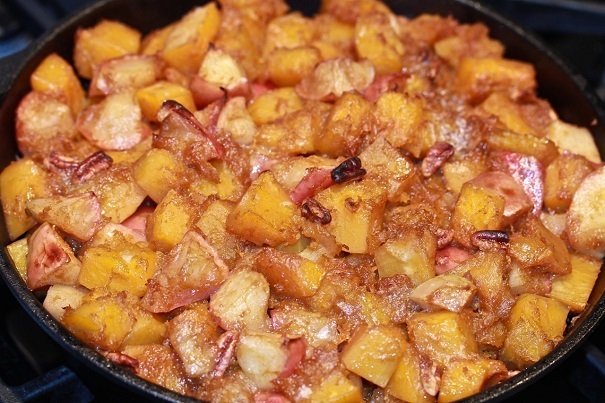 The apples sweeten the squash naturally, and the fiber in both makes it a very filling dish. I would use a firm but sweet apple for this. 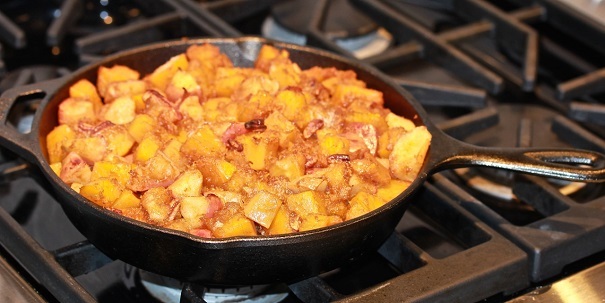 Sauté the squash and apples in the melted butter in a large skillet at medium until juices start to flow. Sprinkle brown sugar and cinnamon on top and mix in. Lower heat, cover, and cook until squash is tender, about 25 minutes. Allow some of the juice to cook down. This can be baked in the oven at 350 degrees for 25 minutes.